According to the UK paper The Telegraph (reported in Fark) , one slice of toast made with seaweed is as effective as a half an hour on the treadmill, and tastes about the same. One cannot let this go unchallenged. I don’t have any artisanal seaweed, hand harvested in the chilly waters of the Outer Hebrides, but I do have some plain old Japanese nori. Let’s switch, and see if anyone notices. I crumbled the nori sheet in my hand. There was lots of dust and fines, but I couldn’t get the big chunks much below dime size — say, twice the size of an oat grain. Came up with almost equal parts by volume of oats and seaweed. Mixed the oatmeal and seaweed dry, then added to the boiling stock. Result: Not bad. Seaweed taste dominant, but not horribly so. Now we’ll see if I get hungry again in half an hour, or if it’s like dwarf-bread: one bite and you realize you’re not as hungry as you thought you were. Next time I might run the seaweed through the blender to see if I can powder it. I might also try rice flour instead of potato flakes to thicken, although mochi is a little sweet for this. We kicked off the first day of Spring here in the NENW with half an inch of snow and 30knt winds. My indoor plants sprouted, and turned all spindly. On the second day of Spring, we had 4″ of snow. Meanwhile, down in Texas, my friend Deb “Red Hands” Tolman, made a big hit with her keyhole garden class in San Saba. Last year, MJ bought me a plastic greenhouse — about 5x4x6ft of plug-together tubing covered with fairly heavy plastic, with 11 wire shelves to put plants on. Over the winter the snow collapsed it, to the point that some of the tubes bent and others poked their way through the plastic. It’s pretty much a write-off. I was able to salvage one section of the shelving, roughly 1x3x3ft, and I’ve brought it inside to start my plants on. After they sprout on the bottom heater, I repotted them and move them onto the bottom shelf. The second shelf has room for about four flourescent lights, vaguely like grow lights. I hope to keep the peas growing in that for another week or so, and the tomatoes until I do my early plant-out in May. We shall see. Things got a little better towards the end of the week, and I was able to break up some old and rotted stumps for inclusion in the keyhole garden. There’s no great rush, since the weather won’t let me plant much in it for another two months. On Friday, as a break from grading, I took a section of wire fencing and wrapped it into a cylinder for the center hole. It turned out to be a little bigger in diameter and a little taller than was needed. Folding and crimping solved one problem, and I’ll wait until the whole KHG is closer to completion before I look at taking a wire cutter to the height problem. 3. non-dairy creamer — when used as a replacement for water when soaking steel-cut oats overnight. 6. Roasted Peanut Asian Dressing, even with ginger. 7. Thai coconut curry culinary broth – we’re not sure this goes with anything. A story in e-Week talks about how US industry is flush with cash, but isn’t hiring because they are unsure about the future. There are some IT jobs out there, more than there were, but the jobs that are hot are the ones that require lots of specialized experience. There’s another indicator, one of my favorites, that shows the pessimism is broader than just IT in the US. 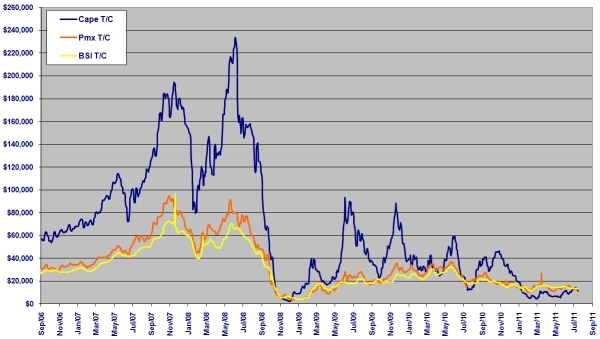 It’s called the Baltic Index, and you probably never heard of it. The Baltic Index measures the average cost to rent supersize dry bulk cargo ships — not containerships, and not tankers, but the kind that haul ore and such. The ships are listed in different categories: PANAMAX are ships that can just barely make it through the Panama Canal, for example. This is what the index looked like last summer, with historical data going back to September of 2006. The weather was cold, windy, and rainsleetsnow all week. On Monday, the graupel was blowing horizontally past the windows. I don’t know what the garden was doing, but I spent the week bundled up in front of the fireplace. And tomorrow is the equinox, Verne. So, here we are at post #300, and I’m beginning to start a tradition — blogging about curried oatmeal on a double-zero milestone. Hey, we can’t all celebrate Spring at Stonehenge. Since last I wrote, Golden Curry has been my condiment of choice for a certain kind of breakfast oatmeal — a sweet, fruity curry — apple juice, apricot jam, golden curry, oatmeal. It is really good. I have also been trying, from time to time, to find a way to incorporate beef broth in my oatmeals, just because I want to maintan a rotation of open broths in the ‘fridge. Beef broth is problematic. I can put chicken broth in, and a few additives, and know it will be good. Beef requires special handling. What I’ve found is that beef wants gravy. So, here is my beef broth / Golden Curry combo. This is a savory curry, not a sweet one. You want to have a noticable amount of potato, but not so much that it soaks up all the gravy. If it’s too thin, it’s soupy. It needs to be stew-thick. Not content with having three alphabets (or two syllabics and a logographic if you’re picky) the Japanese also have a formally formal way of speaking, and a formally informal way. These are not to be confused with the informal formalities, which are mere period pieces and regional dialects. So, one learns the baseline dictionary form of verbs and adjectives, and how to conjugate those forms into formal language. Then, in Chapter 18, they tell you that nobody talks like that, except in letters, and that in real life they use informal conjugations. On the positive side, despite the fact that they are very different from each other, these conjugations are extremely simple and logical…both of them. Oh, did I mention that the adjectives are conjugated almost identically to the verbs? And that these verbs and adjectives climb an intertiwined ladder of additional complexity from present positive to past negative? 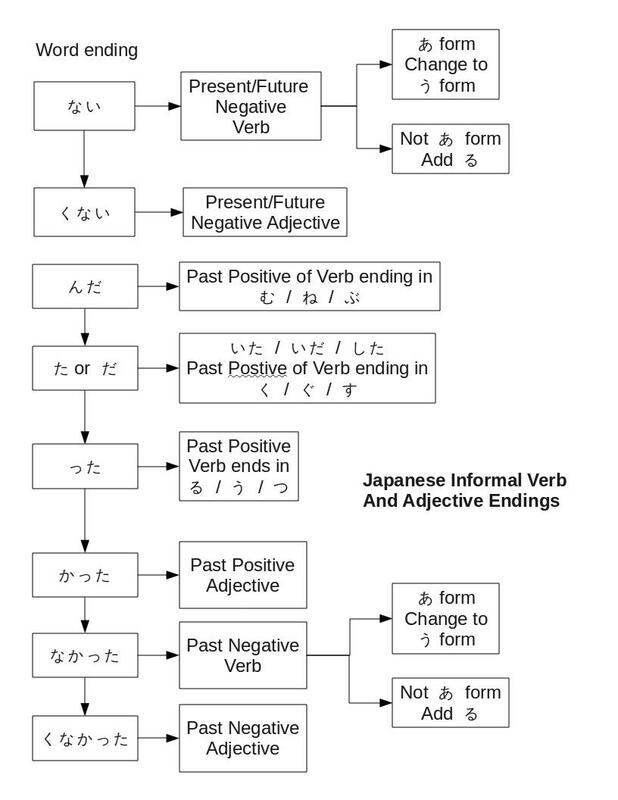 So った (tta) is the past positive form of a verb. And かった (ka.tta) is a past positive adjective. And なかった (na.ka.tta) is a past negative verb. And くなかった (ku.na.ka.tta) is a past negative adjective. See? Easy! In an attempt to keep myself from going mad, I’ve built a key, a decision tree, based on my woefully inadequate understanding of how this works (we’re only on Chapter 18, remember?). Be warned that there are many exceptions, and there are words that look like verbs because maybe the word itself ends in た before ever you start conjugating it. We’ll just ignore that part. This graphic works on 90% of the words I am…currently… working with. As people correct me, and I learn more, I’ll update this. Meanwhile, don’t follow me — I’m lost. Of all the measurements the Wii Fit reports on, my age has the highest variance. I can easily swing from 20 to 70 from one day to the next — and back. I pay attention to it as an ongoing measure of how well my balance and so forth are doing — not as a way of deciding if I should start dating teenagers again. In general, I can keep it below 40, which is nice, but have trouble consistently hitting the bottom stop at 20. The advent of the Wii Fit + made it a little easier to do so. Every now and then I will look in the graphs section to see how my weight and age are doing. Weight is best seen at about the one-month level, because that’s the highest level that will let you look at actual numbers. Age, on the other hand, is best looked at on the year display. That’s because the variance is so high that looking at any lower level is like looking at a mosquito flight path. My complaint is that when you measure your age in the body test, the screen displays it for about four seconds and then moves on. It shows your weight for as long as you like, and lets you switch back and forth between pounds and BMI, but it doesn’t give you a chance to do that on age. This inconsistency in display is a major user interface failure as far as I’m concerned. It’s not as bad as the “clear all your routines by clicking on this unmarked icon” infelicity, but it holds its own as a daily irritant. We had three or four above freezing days at the beginning of last week, which melted all the snow on the ground. The bad news is, when I turned over part of the cardboard in the KeyHole Garden, I found four inches of still unfrozen snow. The good news is, when I picked up a decorative concrete block from elsewhere in the yard (N side of house, so not a warm spot), a great big worm slithered down into its hole. So, I presume the three inches or so of topsoil that the KHG is built on does indeed have critters, and they are likely to be active…just not where the snow is. One of the ways I am filling the KHG with nitrogen-laden materials (AKA ‘green’, of which it wants 1/4) is to rake underneath one of our cedar trees, home to, as Trevelyan might have said, “the songs of innumerable birds”. The other way is with kitchen scraps. They have to be vegetarian, of course. Beef bones and old wine bottles don’t count, even if the wine in them was new. By the end of the week it managed to warm up enough I could lay down another layer or so — one mixed green which it is 15lb of coffee grounds from my barista and a bag of steer manure, overlayed by a brown layer made of a couple months worth of newspapers and a few more inches of raked leaves. I am almost to the top of the cinder block, so I’m going to have to start layering garden soil in and sloping it up to the central wire cage. Meanwhile, I’ve started my bottom-heated seedlings. Four Alaska peas (55 days), two Large Red cherry tomatoes (75), four Beef Maestro hybrid tomatoes (80), and four Superba hybrid tomatoes(80). That’s days from transplant, which will be in mid to late May, depending on what the wx looks like. I have two more holes in my self-watering bottom heater, and I’m still trying to decide what goes there. I have given up trying to grow anything useful on the South Face of the house, so my cunning plan for this year is to put in a half dozen hops plants and see if I can get some shade. I’m planning on about ten tomato plants in pots, plus two hanging plants (that’s the cherries). Have not yet decided on what to put in the keyhole garden. The tradition is, you pack the plants in. Deb Tolman, down in Texas, has put 70 tomato plants in ONE 28sqft KHG!! Mine will be ~40sqft this year. Plus, I have another 150sqft of regular garden. Part of that will be the peas — the four I’ve just started, plus another batch I’ll start next week, plus some that I plan to direct seed at the end of the month. The calendar said I could direct seed last week, but that would have required blasting caps or steam drills. Tohoku (東北) is the name of the six prefectures that make up the northern end of Honshu, the main island of the Japanese archipelago. The name is made up of two kanji: 東 (ひがし hi.ga.shi), meaning East, and 北 (きた ki.ta), meaning North. In typical Japanese fashion, the symbols are pronounced one way when alone (kun pronunciation), and a different way (on pronunciation) in a compound word (とうほく to.u.ho.ku). Today is the first anniversary of the Tohoku earthquake and tsunami. It seems a lot longer. Here is a discussion of what it’s like, living in coastal Tohoku today. Here is a set of satellite images (before, after, and now — reading up) of the damage to the city of Nagatsura, and the Kitakami River. The city is permanently changed because of changes in the level of the land. This is a photo-essay of the region in the immediate aftermath. And here is a set of interactive photos, showing how the debris clearance is going. Meanwhile, the local Toyota plant (inland, but still impacted by supplier outages), is just hitting its stride again. 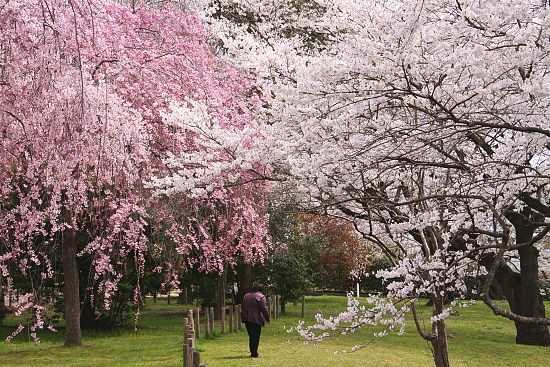 In another month, there will be cherry blossoms. In the interest of equal rights for starches, I thought I’d try rice instead of potatoes as an oatmeal additive. This uses leftover rice from the night before. You know, the stuff that’s gotten really hard in the fridge. Experiment 1: I used a scant quarter cup of rice, which is probably half again the weight of a rehydrated tablespoon of potato buds, plus a hefty quarter cup of 20min oats. I also used up the last of my current pack of Golden Curry. Beef broth. Results: Very good. Even with the curry dominating everything, the rice flavor was there, and the rice grains gave it a very different mouth feel. I plan to do it again, without the curry. Experiment 2: Same setup, except with a cup of vegetable broth, and a quarter cup of Coors beer. Results: OK. Pretty bland. A grab sample of shredded cheese did wonders for it. In the early 1960’s, H. Beam Piper wrote an SF novel (Kalvan of Otherwhen) about a police officer who gets sucked into a “para-time transporter” and shifted to an alternate reality. Early in the book, he describes Corporal Calvin Morrison of the Pennsylvania State Police and his fellow officers approaching a house where a known felon was hiding. This man Morrison and three other state police officers were closing in on a house in which a wanted criminal was hiding. He must have been a dangerous man–they don’t go out in force like that for chicken–thieves. Before he started writing SF, Piper was a railroad detective, and was familar with police work. In the same way that The Great Gatsbey gives us contemporary descriptions of traffic conditions on Long Island in the 1920’s, or a late 14th Century discussion of paint gives us information on living conditions, Piper’s passing mention gives us an idea of how many state troopers it took to bring in an armed killer, half a century ago. Meanwhile, last week in Florida (of course), fifty-some officers and a SWAT team responded to the possibility that a 75 year old man (who was asleep) had threatened his family. I guess he’s lucky they didn’t deploy the eight-ton APC, or one of the two tanks the nearby Tampa police department owns. The Florida incident illustrates the ongoing weaponization of American police forces. Here’s a Tom’s Dispatch essay on the topic. As usual, the essay is more interesting than the lead in. I am worried, America. In less than a decade I’ll turn 75. And so we embark on another gardening season. Actually, since there’s still snow on the ground and we expect temps in the 20’s later this week, it’s more of a pre-gardening. What I’m doing is prepping the garden for later. Part of that is converting one section of it into a keyhole garden. A keyhole garden, for those of you too busy to click a link, is a rock-bound, deep-bed, raised-bed garden with a ‘keyhole’ entrance that lets you get to the central shaft, where you dump kitchen scraps. I’ll do something more detailed later. Suffice it to say your standard KHG is 6ft in diameter and two or three feet high, with the central peak running up to a foot higher at the central shaft — sortof like a volcano. Since I am converting one section of a rectangular garden, mine will be roughly 6ft x 8ft, and only three cinder blocks (24″) high. If that works, I will eventually do the whole garden, and it will look like a volcano chain. My other project will be repairing (maybe) the plastic greenhouse MJ bought me last year. It’s roughly 6ft x 4ft x 6ft (LWH), and made of cheap plastic tubing connected via cheaper plastic angled tube spiders…or whatever they are called. Whatever they are called, they are fragile (broke a couple during assembly), and they couldn’t support the weight of last month’s snow, so the whole thing collapsed. I am thinking of what I can do to fix it that would be worth the time. Last year demonstrated that it was very good at heating up in the daytime, but not so good at retaining the heat after dark. Finally, I’m going to start working on my counter-squirrel ops. I plan to live trap them and transport them several miles before releasing them. With any luck, a hawk will get them on the way back, or they’ll read the signs wrong and take the exit to Airway Heights. I started this blog on this day, three years ago. Since then, I’ve moved from my original tool to WordPress, changed the name, included pictures, kept on blogging. The stats are slightly off, since WordPress only counts starting from the Great Renaming, in May of 2010. Since then, I’ve averaged 7 hits per day — 12/day this year, up from 4/day my first year. That level is fine with me, because I’m doing this mostly for fun. It would be nice to know that what I write had greater meaning, but systems people are steely-eyed realists, and the level of effort I can put in right now is deserving of no great flow of visitors. So, thanks to my handful of real friends, and also to the dozen or so who just stopped by now and then. I plan to keep at it. You can too. So here is the latest on TSA’s inability to provide effective airline security. I held off on publishing this, because very often things that come out on the web turn out to be sensationalist reporting. This doesn’t seem to be one of those. Steve Moore appears to have the credentials, and he certainly has the opinions. He’s conservative to a fault, and as far as I can tell, this the first time he’s written about TSA (meaning this isn’t part of a larger agenda). Most of what he said I didn’t find surprising. It had been said before. The fact that someone with his background has finally said it is what makes it newsworthy, just as when people with extensive and current Afghanistan experience say it’s time to leave. I can say the same thing, but I’m just this old fart, non-current, semi-retired guy. So, we have expert testimony that TSA is dangerously incompetent at catching Al Qaida terrorists (or any other kind). We have (see an earlier rant) an Assistant Secretary of Defense saying that Al Qaida isn’t, and hasn’t been, that much of a threat. How much more do we need? Our current Democratic administration can’t do what needs to be done — disband TSA, and turn its job over to a more effective organization, like, say, the Girl Scouts — for fear of being labeled soft on terrorism (OBL is so last year). If I thought a Republican administration would have the balls of a Henry Kissinger and be willing to take TSA on a metaphorical trip to China, I’d seriously consider voting for them. But there’s too many opportunities for federal control of our lives, and too much contributor money at stake for the Republicans to even consider something like statesmanship as an option. The trouble is, once a bureaucracy is created, it never goes away. The traditional story is of a UK guard unit that was posted near Dover to watch for a Napoleonic invasion in 1803, and was finally withdrawn in 1927. As an aside, the alternative version is that there was a single man in a civil service position. I’ve found brief filler articles from five different 1944 newspapers that say the job had just been deleted after the death of the current incumbent. All five are obscure US papers, and I don’t have a single reliable British source for any of this, but it illustrates the point. Bureaucracies never get smaller. They not only grow, they also attempt to collect more power. The only thing that can stop them is well-funded special interest groups, and that in itself speaks worlds about our government. The cancer that is TSA won’t go away. It won’t lose any of its powers. Given the decade-long climate of fear, there’s no prospect that this will change in my lifetime. And so we continue our slide into a police state. MJ made stuffed peppers using ground buffalo the other night. Given that I had been at the peppers to get stir fry ingredes it was more like meatloaf & pepper, but it was still good. It produced a surprising amount of juice, and given that it was buffalo, it was meat juice, not fat. So I poured it off, about ha’cupworth, and used it the next day with my oatmeal (standard recipe, including potato flakes). Result: Very good. Again, the driving factor in how good oatmeal tastes is how flavorsome the fluid is.